A sea of patients flood Grey Sloan Memorial after gunfire goes off at a parade. A blast from the past throws Maggie off her game on the same day that Meredith tries to talk to her about her dating situation. Meanwhile, Owen and Amelia get some potentially life-altering news about Betty. Grey’s Anatomy stars Ellen Pompeo as Meredith Grey, Justin Chambers as Alex Karev, Chandra Wilson as Miranda Bailey, James Pickens Jr. as Richard Webber, Kevin McKidd as Owen Hunt, Jesse Williams as Jackson Avery, Caterina Scorsone as Amelia Shepherd, Camilla Luddington as Jo Wilson, Kelly McCreary as Maggie Pierce, Kim Raver as Teddy Altman and Giacomo Gianniotti as Andrew DeLuca. Guest starring is Jennifer Grey as Carol Dickinson, Greg Germann as Tom Koracick, Alex Blue Davis as Casey Parker, Sophia Ali as Dahlia Qadri, Jake Borelli as Levi Schmitt and Jaicy Elliot as Taryn Helm. “I Walk the Line” was written by Tameson Duffy and directed by Kevin McKidd. Air Date: Thursday, Feb. 14 (8:00-9:01 p.m. EST), on the ABC Television Network. GREY'S ANATOMY - "I Walk the Line" - A sea of patients flood Grey Sloan Memorial after gunfire goes off at a parade. A blast from the past throws Maggie off her game on the same day that Meredith tries to talk to her about her dating situation. Meanwhile, Owen and Amelia get some potentially life-altering news about Betty on "Grey's Anatomy," THURSDAY, FEB. 14 (8:00-9:01 p.m. EST), on The ABC Television Network. 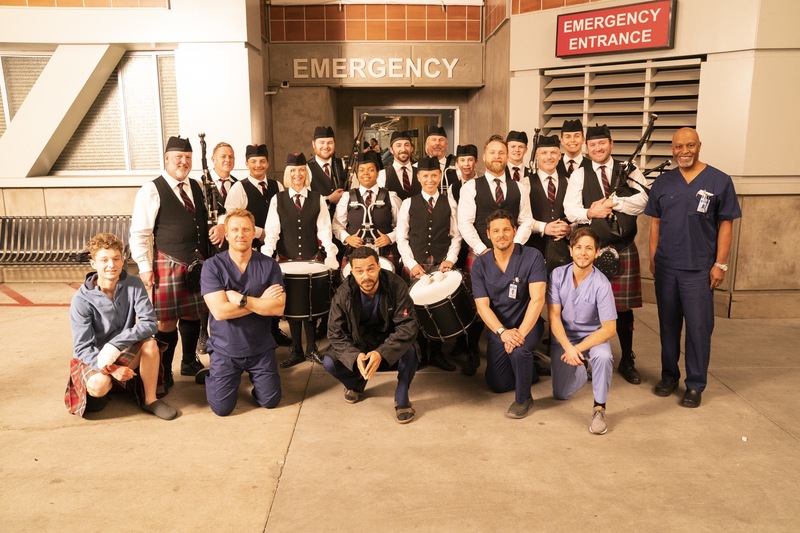 (ABC/Mitch Haaseth) LA SCOTS PIPE BAND, KEVIN MCKIDD (DIRECTOR), JESSE WILLIAMS, JUSTIN CHAMBERS, ALEX BLUE DAVIS, JAMES PICKENS JR.